Simply Knowledge Homeschool: Encouraging the Reluctant Reader in 5 Simple Steps - Free Printables! 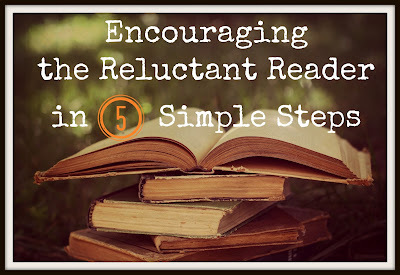 Encouraging the Reluctant Reader in 5 Simple Steps - Free Printables! That is not the case with me. I love to read myself and I just thought "longingly" that when my children were old enough to read they would love it too. Well, I am there now and I have faced the battles of trying to get my children to read without a fuss. Not only without fussing but actually "enjoy" reading. Every day I include a block of time in our homeschool schedule just for “quite” reading time. I usually allow thirty minutes. During this time we turn off all distractions – computer, tv, etc. By doing so, it sets the tone for a great reading environment. In our home, we have a *special* space just for reading. Sweet Pea and Tutti Frutti each have their own bean bags. 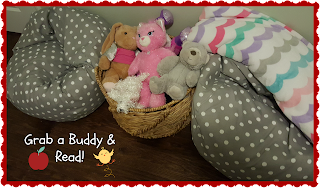 I have also included in this space a basket full of friends (they can choose one to cuddle with while reading) and a blanket. This is one of the greatest and most successful tips I can give: make reading fun! How? Kids love games and they love challenges, create a reading challenge just for your child. One challenge idea, could be to fill up their reading log using stickers or stamps for a special treat or maybe a trip to their favorite place. Below I have some links to some super kid friendly reading logs! Another option to make reading fun and a challenge is to do a 100 Book Challenge. One of the best ways to encourage your child to read is to lead by example. Let your child see you reading! Talk about books and the adventures they can take you on! Share memories of your favorite books as a child. Remember, your children are never to old for you to read them a story  You can also include these stories you read to them in their reading log challenge. Just remember don’t give up! Homeschooling your children is a fun and wonderful journey. Don’t sweat the small stuff! Do you have any tips for mom’s with reluctant readers? How do incorporate reading your homeschool? I would ♥ to hear from you!